The hugely anticipated Beta for Battlefield Hardline now has a date, and it’s soon, February 3rd to be exact.What can we expect to see during the Beta then? A recent post on Battlefield.com gave us all the details we needed to know. They also released a nice new trailer, showing off what it will look like. During the time of the Beta we will be able to get our hands on three different maps and game modes. 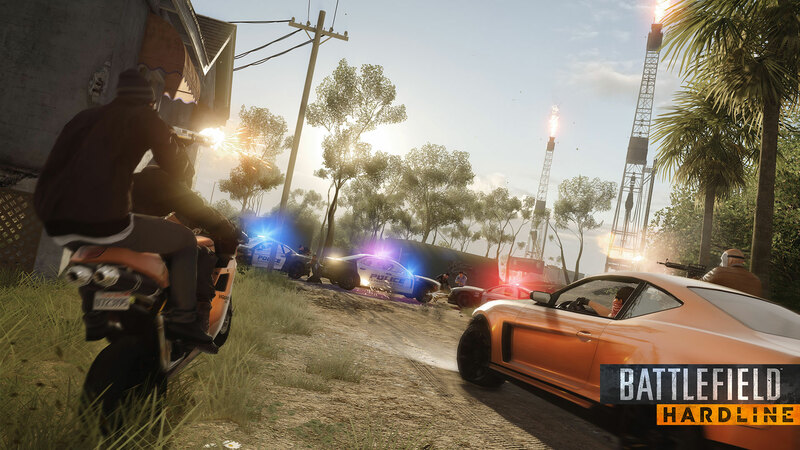 First off, Hotwire mode brings high-speed chases to the Battlefield, as the criminals attempt to steal a list of marked cars while the cops try to repossess them. Available on two maps in the beta, Downtown and Dust Bowl, success in Hotwire will require excellent teamwork and precision driving. A good start! I like the sound of that. The desert town of Dust Bowl known for its drug trafficking problems will also be playable on Conquest, the fan favorite Battlefield mode, which takes the battle up to 64 players. You can’t go wrong with a bit of Conquest in my opinion! Finally, there’s the Bank Job map where you’ll get to try out Heist mode. The criminals are trying to break into a bank vault, but the cops are doing their best to stop them. Which side of the law will you ride with? I think this was the same mode that was available during the Alpha if my memory serves me correctly. I really like the sound of this mode, it sounds like it could be a lot of fun. Plus if you take part in the Beta you will also receive an exclusive dog tag for Battlefield 4. The dog tag will be unlocked in Battlefield 4 once the next patch hits the game, but no specific date has been mentioned of when that is. I’m sure all you hoarders or completionists will want to get your hands on this. I’m actually really looking forward to the Beta, I think it looks like it could be a lot of fun. EA and Dice also know they have a lot to do to win back fans after the multitude of issues that surrounded the launch of Battlefield 4. Here’s hoping this means they take extra time and care to make sure everything is great!